Some newborn infants have serious reflux problems that can result in gastric fluids ascending the esophagus to the trachea, where the fluid can then be aspirated into the lungs. Current gastroesophageal reflux (GER) diagnostic tests are invasive, use a pH probe mounted on a nasoesophageal catheter that does not detect non-acidic gastric reflux, and have diagnostic inaccuracies and limitations. GER is characterized by frequent and persistent heartburn, which occurs when the lower esophageal sphincter (the valve separating the esophagus and stomach) does not close properly, allowing liquid and gas stomach contents to back up into the esophagus. GER typically causes discomfort and irritability. More than half of all healthy infants experience GER in the first three months of life, with most outgrowing the condition by the age of 12 to 24 months. However, some newborns have severe reflux symptoms including respiratory distress, aspiration pneumonia, and apnea. Michigan State University’s invention is a noninvasive GER diagnostic test comprised of external acoustic sensors and a signal processing and recording device that accurately measures the frequency, duration, and amplitude of gastric reflux episodes as they occur. Reflux is detected by up to four accelerometers that are evenly spaced longitudinally along either the sternum or the thoracic spine and taped to the infant’s skin. Reflux detection has been confirmed by ultrasound and compared to other techniques, such as pH probe and upper GI X-rays. An IRB protocol is in place and a study is underway to examine both symptomatic and non-symptomatic preterm and full-term infants. · Noninvasive: The sensors are attached to the infant’s skin with tape and accurately detect and measure reflux episodes. Other methods, such as pH probes, impedance monitors, or combinations thereof, are invasive and require nasoesophageal tube placement. · Measures amplitude: Accurately measures the amplitude of reflux in the esophagus. · Useful for long-term monitoring: Other noninvasive methods, such as ultrasound, are not suited for long-term monitoring. · Broad scope of data collected: The device accurately measures frequency, duration, and amplitude of reflux episodes over an extended period of time. 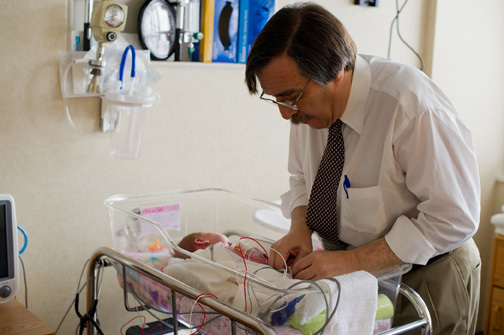 The invention is useful for physicians and allied health professionals in private practice or associated with hospitals, including family physicians, neonatologists, pediatric gastroenterologists, speech and feeding therapists, and pediatricians. The invention has also been tested in older children (up to one year) and can thus aid in diagnosis and test of therapeutic usefulness in older children with dysphagia or cerebral palsy. A functional prototype has been developed and proof of concept studies are in the planning stage.